Public sector organizations manage large volumes of valuable data. But, too often, this information is locked in legacy database silos that are hard to access and even harder to use. As a result, this information sits idle or is, at best, underutilized. Open data provides a unique opportunity to transform this situation by putting a resource that governments already have in abundance -their data assets- to work. Socrata helps customers solve their data access and usability problems through a suite of innovative, cloud-based software solutions. 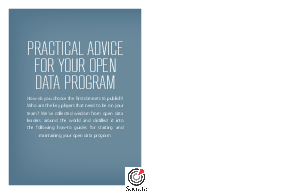 By using Socrata’s Open Data portal solution, public organizations can serve as catalysts for a new era of innovation and civic participation. Specifically, they can use technology from Socrata to increase transparency, improve performance through data-driven decision-making, and foster the development of open data applications that address critical needs in areas from transportation to public health and safety, and beyond. Please download the white paper to learn more.